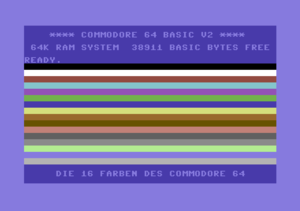 The 16 colors of the C64. The C64 has 16 different colors. These 16 colors can be used in all possible screenmodes, for chars, the screen (background or frame) or for sprites (multicolor, HiRes), etc. The colors of the text can be changed direct with a keycombination or with PRINT CHR$(Wert) alternative control characters. To change colors of sprites or HiRes-graphics in BASIC the command POKE memoryadress, colorcode must be used. 55296-56295 Color-RAM - With these memory addresses the individual color of all 1000 chars within the screen matrix (25 lines by 40 columns) can be controlled; for example: POKE 55296,1 sets the first char at line 0 and column 0 with the color white. This page was last modified on 8 September 2018, at 16:46. This page has been accessed 45,481 times.